There’s a (relatively) well-known method of fixing dead lines on the DMG-01 (classic Gameboy) LCD screen which consists of dragging a hot soldering iron across the connection of the brown plastic connector with an epoxy blob, and the glass. The right spot in underneath where there’s normally a black rubber strip. 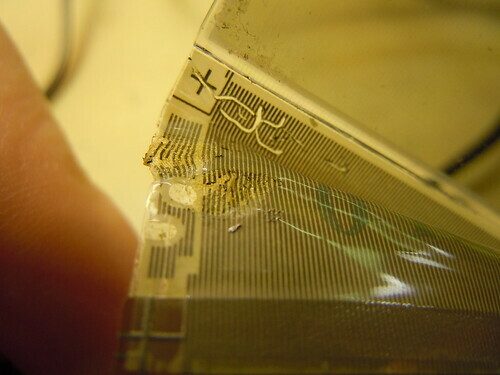 This will reflow the glue, solder or whatever is used for the attachment, and the method can usually successfully fix dead vertical lines. Sometimes people ask whether horizontal lines can be fixed as well. I’ve always assumed that the connector on the right side of the screen, which would be at fault if there are dead vertical lines, is basically identical, and that the only problem with fixing horizontal lines is the more awkward position of the connection — the “ribbon” is connected on the bottom side of the LCD glass, so you need to fit the soldering iron into a small corner without damaging anything. However, the ribbon connector on the right side is different and more fragile. If you look at the top image, you’ll see a connector that looks brown. Technically speaking, this is called a flexible PCB (printed circuit board.) Just like on a regular, rigid PCB — like the display daughterboard itself — you have copper traces for connections and a green solder mask. 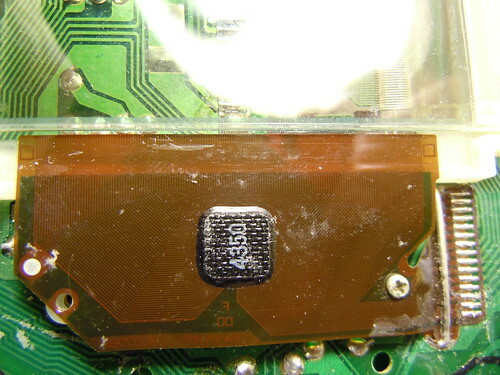 The black blob in the middle is an integrated circuit, not unlike the chips you would see on any other circuit board, only that this one is hidden within a blob made of epoxy, and the circuit on the chip is connected directly to the copper traces, rather than using external pins soldered to a circuit board. 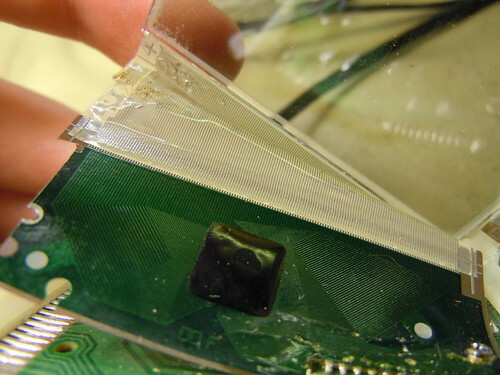 The right side connector has a similar flexible PCB, but the last stretch of the connection is made by a flimsy white plastic material which is easily damaged by the heat from a soldering iron. The actual connectors are not made of copper but possibly carbon or some other conductive material. My advice is, do not try to fix dead horizontal lines. You’ll likely just mess up the connector as seen below. This page was previously hosted on http://gameboygenius.8bitcollective.com/wordpress/2011/07/ (*).